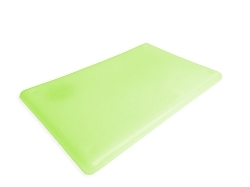 The UV Matlite is the ideal night light for bedrooms, bathrooms, cabins, campers, hotels, and more. It provides a night light illumination without using batteries, batteries, bulbs, or electricity. 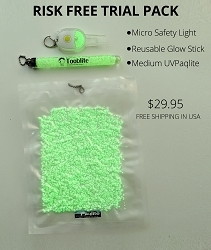 It absorbs any light to recharge, glows in the dark all night long (10 - 12 hours) and lasts forever. It's reusable over and over again forever! Non-toxic. Made in the USA. How much light does it need to charge? A very small amount of ambient light is required to fully charge the Matlites i.e. ambient light from a window, light from the doorway, or turning the light switch on throughout the day. Direct sunlight is NOT required. Can I cut it? Mount it? Or use it outdoors? Absolutely! You can easily cut it with a handsaw or electric saw. It can be mounted on a wall or against a tree using screws or nails. Use it indoors or outdoors, rain or shine, and in any temperature. Bathrooms - Set in on your countertop or the back of the toilet. When you wake up in the middle of the night you won't have to turn on the light switch. Bedrooms - The low-level green light provides just enough light for the kids to see but it's not bright enough to keep them awake. Power Outages- Whether the power outage lasts one night or weeks the UV Matlite will provide you and your family with a reliable light source every night...it will never wear out. Sailboats - Looking for a light for the head that won't drain your boat batteries? This is it! Cabins & Campers - Going off grid? This is the light you need. It won't drain your battery storage and doesn't rely on LEDs or electrical components to work.